Art Blast! 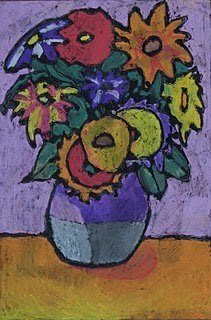 : January/February 2011-Crazy About Van Gogh! January/February 2011-Crazy About Van Gogh! This is a 2 part class discussing the life and works of Vincent Van Gogh. There will be two projects and due to drying time involved it will be a 2 part class, January and February. 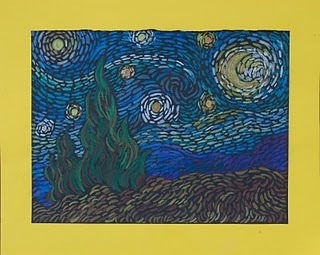 One project will be inspired by Van Gogh's painting, "Starry Night". The other project will be inspired by Van Gogh's painting "Sunflowers". The students will use primacolor pencils and chalk pastels. The students will learn the importance of design, cast shadow and overlapping of shapes to give the work a three dimensional look.